After years working in the field of performance capture, Oscar-winning director Robert Zemeckis returned to live-action filmmaking with ‘Flight’, his first since the remarkable ‘Cast Away’ (2000). With Denzel Washington in the lead and a fascinating central premise, this promised to be an exciting return for the beloved filmmaker, whose distinctive and uncompromising style had made many of his previous films instant classics. ‘Flight’ promises a lot... but this one may not entirely leave the ground. 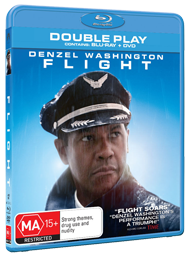 Pilot Whip Whitaker (Denzel Washington) becomes a national hero when he pulls a remarkable and daring manoeuvre trying to prevent the commercial flight he is piloting from an horrific crash. Whitaker, however, is also a raging alcoholic and drug addict, in complete denial, and this may be enough to have him charged for manslaughter for the handful of deaths from the crash. Refusing to accept that he has a problem, Whip smashes through his life and the people around him, including reformed addict Nicole (Kelly Reilly), another lost soul who tries to connect with Whip and help him accept. ‘Flight’ is almost entirely worth the effort for its first fifteen minutes, encompassing the crash itself. With ‘Cast Away’, Zemeckis had executed a terrifying crash sequence. For this film, he’s almost outdone himself with something even more intense and visually staggering. It’s a tremendous way to open a film, combining Whip’s intoxicated incoherence with the disaster that clearly isn’t the pilot’s fault. The mystery of the crash and the post-crash investigation are the most intriguing aspects of the film, and how Whip can navigate through suspicion when his flaws are so clear. Unfortunately, ‘Flight’ seems more interested in becoming a character study of Whip’s addiction, and after a thrilling first act, the film quickly becomes flabby and uninteresting, throwing in character scene after character scene with very little to drive the movie forward. It isn’t helped by the presence of Nicole, who, for all of of Reilly’s great work, seems like nothing more than an ill-conceived plot point: a character only there to tell Whip he needs help before completely disappearing. Very few of writer John Gatins’ characters are actually likable, especially Whip, who seems to just make stupid mistake after stupid mistake, so that the point where he finally takes responsibility for his problems falls completely flat. We don’t feel anything for Whip taking the reins of his life because we’ve spent over two hours watching him act in such a petulant, irredeemable way. The film looks great, but the rhythm is plodding and Gatins’ dialogue is generally obvious, sometimes hilariously so. There are too many themes at play here, and the film sags horribly under the weight. Denzel Washington is, of course, great as Whip, but that’s also part of the problem. There’s nothing unusual or unexpected about his work. It’s a walk in the park for him, and something about his performance suggests this might be how he approaches it. In the hands of another actor, it might have been more affecting, but the twinkle in Washington’s eye that we’ve always loved just isn’t here. The supporting cast is grossly underused, including John Goodman as Whip’s wise-cracking drug dealer Harling (who could have easily fulfilled the role occupied by Nicole) and Melissa Leo as investigator Ellen Block. I doubt these terrific actors are on screen for five minutes, if that, and it's to Zemickis’ credit that he can fill his film with such great actors, and Gatins’ fault that they have nothing to do. ‘Flight’ aims high, and certainly seems to think it reaches there, but in actuality, the results are bloated, dull and unsatisfying. There’s so much promise in there, especially after the terrific opening act, and a drastic edit could have made this a leaner, meaner film. As it is, ‘Flight’ seems like an insubstantial piece of material for Zemeckis, and one with as many irredeemable features as its protagonist. ‘Flight’ aims high, but in actuality, the results are bloated, dull and unsatisfying. As to be expected, ‘Flight’ looks and sounds terrific on Blu-ray. There’s a steely quality to the 2.40:1 1080p transfer, the film made up of lots of greys and blues. The level of definition and detail in the transfer makes for a handsome image, replicating the careful framing and focus Zemeckis employs. The DTS-HD MA 5.1 track is at its best during the crash sequence, creating an overwhelming and thunderous experience, before fading out nicely for the dialogue scenes that make up the rest of the film. What’s on offer here is a little insubstantial, not only in the short duration of all four featurettes, but also in the detail they contain. Gatins discusses how the project was conceived in ‘Origins of Flight’, but this still offers little explanation for what the film is trying to say. Two generic making-of featurettes are at their best when discussing the technical requirements of the crash sequence, with one featurette devoted entirely to it. The ‘Q&A Highlights’ might have been more interesting if it wasn’t so heavily edited. The 'Flight' competition has now closed. Winners will be announced shortly. Competition opens at 5pm AEST on Sunday 16th June 2013 and closes at 11:59pm AEST on Sunday 23rd June 2013. Five winners will be chosen at random on Monday 24th June 2013. To successfully win, entrants must fulfil the above entry conditions before the time the competition closes. Current members/followers are eligible to enter the competition. Only one entry per person. Only one winner per household. To be a valid winner, the entrant must not have won a prize from SWITCH within the last 28 days. Each winner will receive one Blu-ray copy of 'Flight'. By entering, you agree to receive occasional emails from SWITCH in the future. If you decide to unsubscribe from these updates, any further entries will not be applicable. Only Australian residents are eligible to enter. 'Flight' is available on Blu-ray and DVD on Wednesday the 19th June 2013 from Paramount Pictures.